Pros: An intelligent and complex score that’s well performed by the talented cast. Cons: The intricate orchestrations and sometimes distracting Kentucky accents make the show occasionally sound muddled. 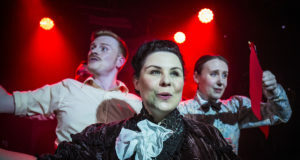 A well-staged and atmospheric revival of a daring show that goes beyond the usual light-hearted musical theatre fare. 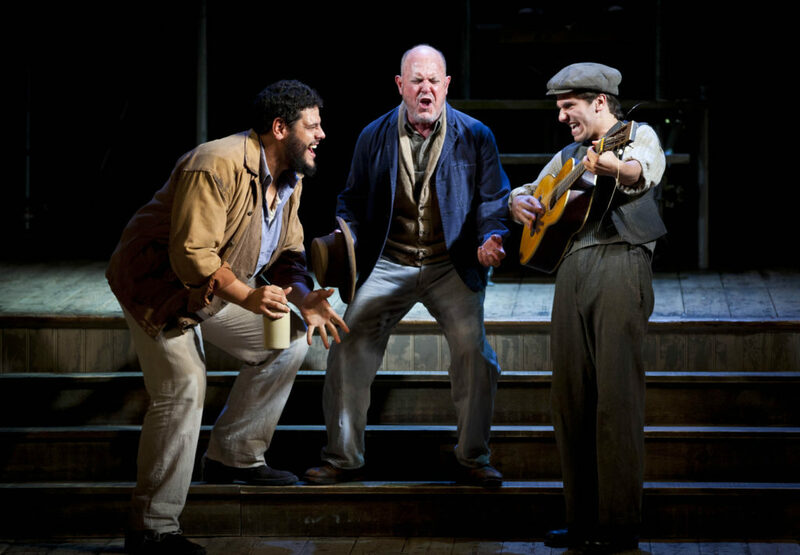 Though composer Adam Guettel is the grandson of musical theatre legend Richard Rodgers, audiences should not go into Floyd Collins expecting the catchy melodies and frothy love stories of musical theatre yore. 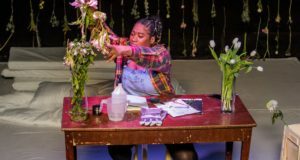 This ‘underground’ chamber musical, now playing in a thoughtful and atmospheric revival at Wilton’s Music Hall, is one that challenges as it entertains. By underground musical, I don’t just mean figuratively. Floyd Collins tells the true story of its titular character, a cave explorer in 1920s Kentucky who discovers the cave that will bring him fortune and glory, only to get himself stuck underground on his way back up to the surface. As Floyd remains in the hole, losing both sanity and hope, the musical explores his relationships with his loyal siblings and the media frenzy that ensues as his plight continues, with thousands descending on the small country town to capitalise on the tragedy. The centrepiece of the show is Guettel’s daring score, which uses bluegrass and Americana influences and intricate musical rhythms to astonishing result. The musical is never hard to follow, but Guettel’s score rewards the thoughtful listener, as he opts for complex orchestrations and haunting melodies over a series of toe-tapping tunes. In contrast to the big-city journalists who are criticised in the show for exploiting Floyd’s struggle for their own gain, Guettel’s bold score takes Floyd seriously, and adds a weight and humanity that doesn’t trivialise this real-life tragedy. This score is brought to life by a very talented cast, with the lilting soprano of Rebecca Trehearn as Floyd’s sister Nellie being a particular highlight. Floyd’s brother Homer is also heart-wrenching as portrayed by Samuel Thomas, and as the titular character, Ashley Robinson plays Floyd’s plight emotionally whilst never losing the happy-go-lucky personality at his core. Adding to the production is its setting at Wilton’s Music Hall, whose cavernous yet faded atmosphere lends itself both to Floyd’s ‘cave of wonders’ and to the rural Kentucky town. The set is quite bare, with tiers of metal scaffolding that illustrate Floyd’s subterranean setting without feeling overly literal or claustrophobic. Director Jonathan Butterell makes good use of the space, maneouvring between the above- and underground settings without any confusion. With such huge ambitions, though, the production is not without its missteps. The sound of the show feels muddled at times, which seems to be due to a combination of Guettel’s layered orchestrations (though performed well by the 8-piece band) and some less-successful attempts at a thick Kentucky accent by members of the ensemble cast. And while the show’s two women are some of the strongest performers, with the most intriguing characters (Sarah Ingram joining Trehearn as stepmother Jane), their roles feel frustratingly underused and underdeveloped compared to the men. Still, despite these lucklustre aspects, the musical’s brilliance shines through. 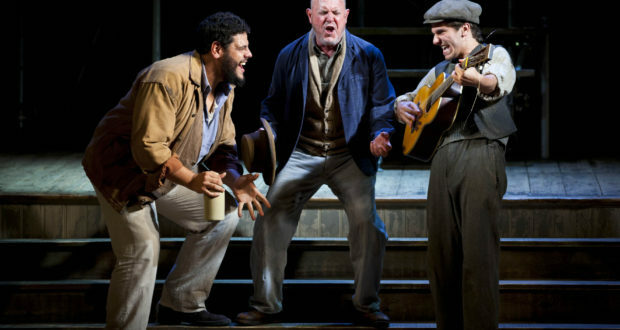 Musical theatre fans searching for something that goes beyond the usual fare may find that Floyd Collins is just the ‘cave of wonders’ that they’re looking for.